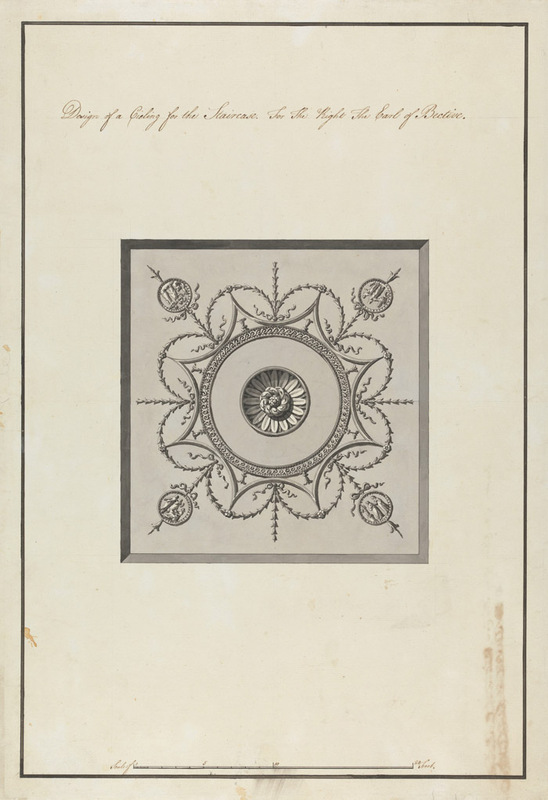 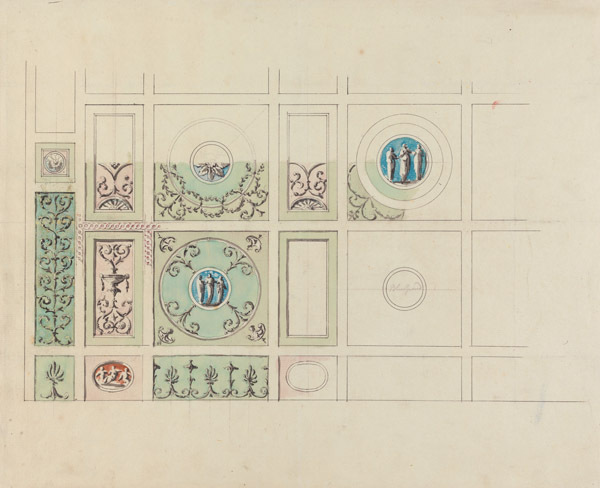 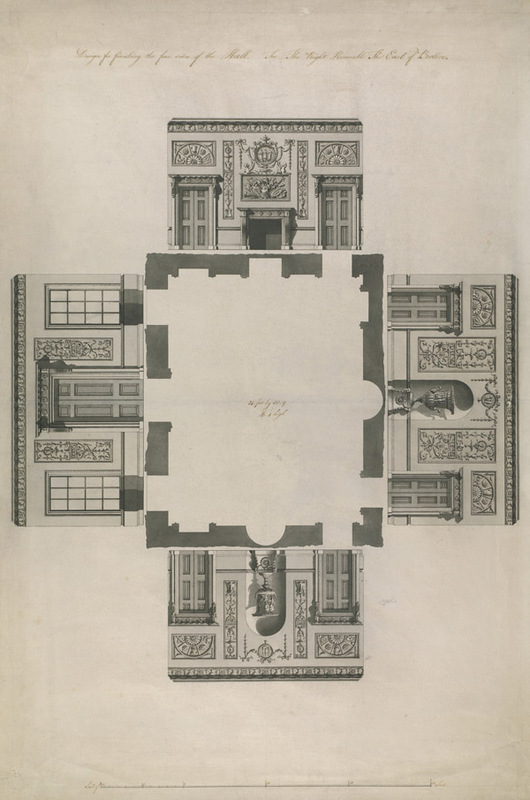 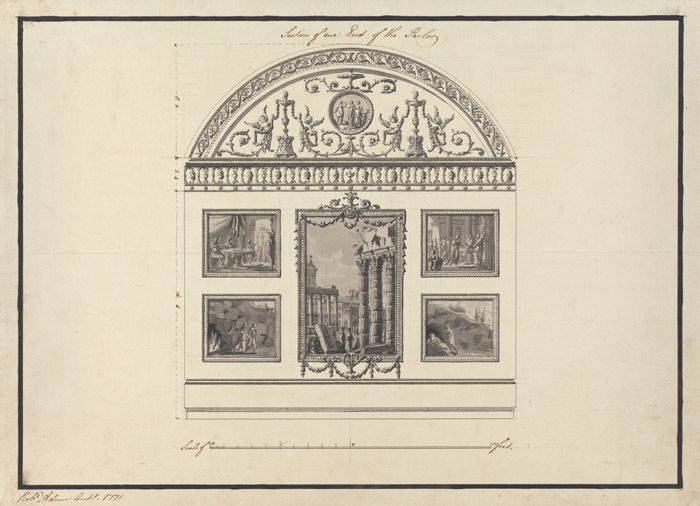 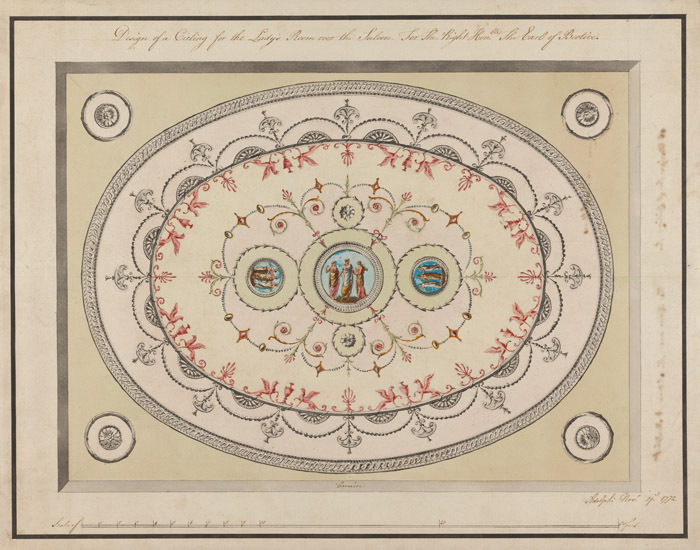 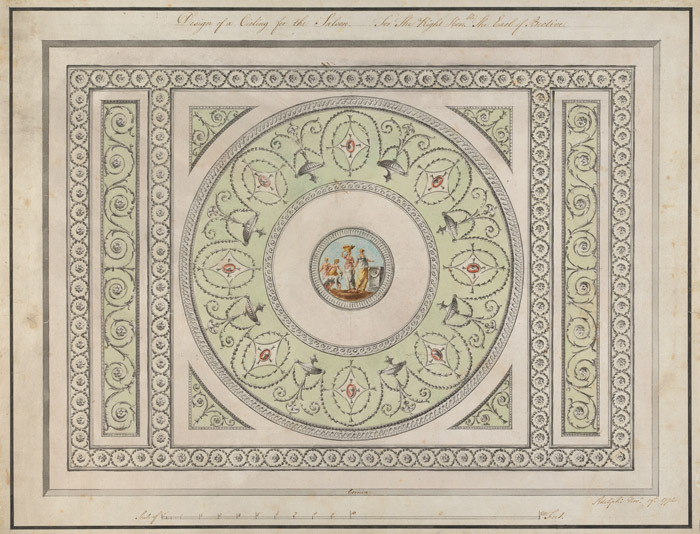 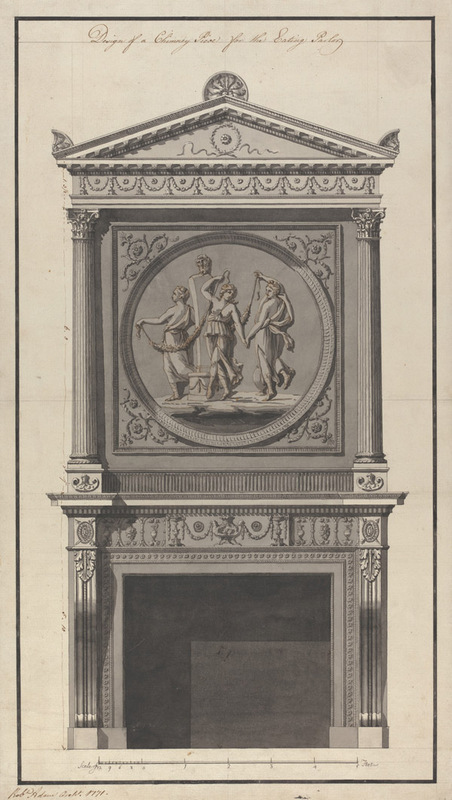 Designs for internal decorative schemes for Headfort House – the house designed by George Semple in 1769. 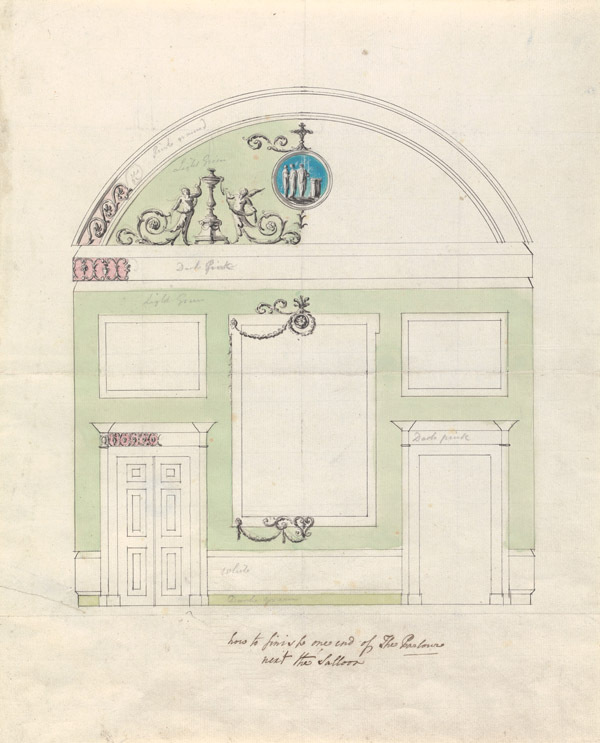 Between 1771 and 1775, Robert Adam was commissioned by the 1st Earl of Bective to design a suite of rooms for the newly completed house. 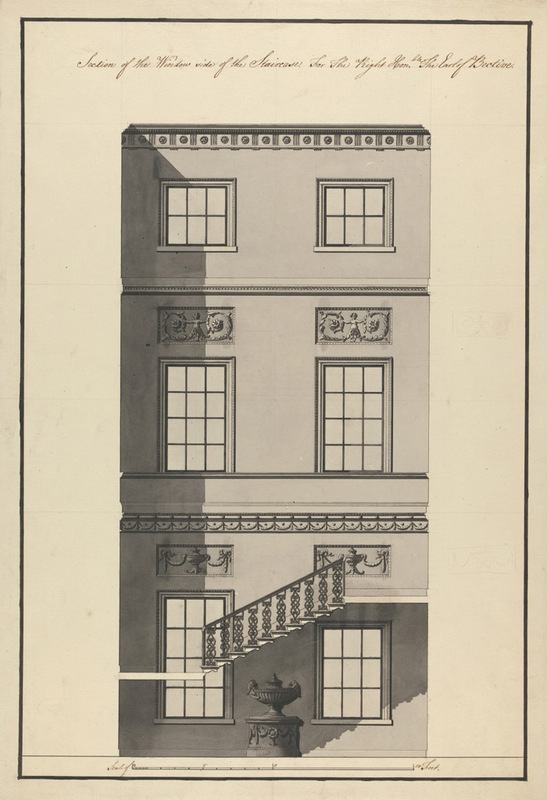 Adam had previously worked for Bective’s father-in-law, Hercules Rowley at Langford House in Dublin in 1765. 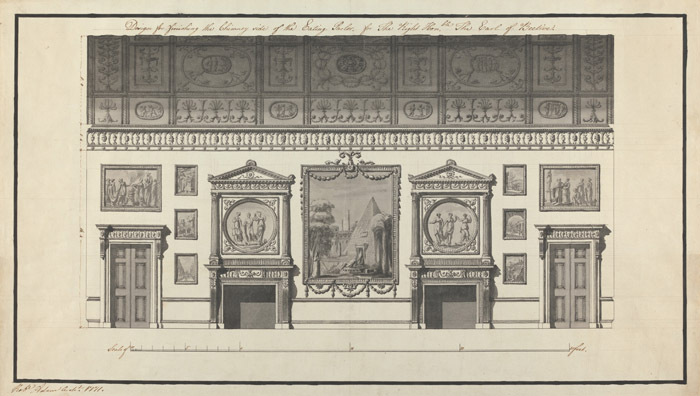 Adam produced designs for the decorative treatment of the entrance and staircase halls, a ‘Lady’s Room’ and the magnificent ‘Eating Parlor’. 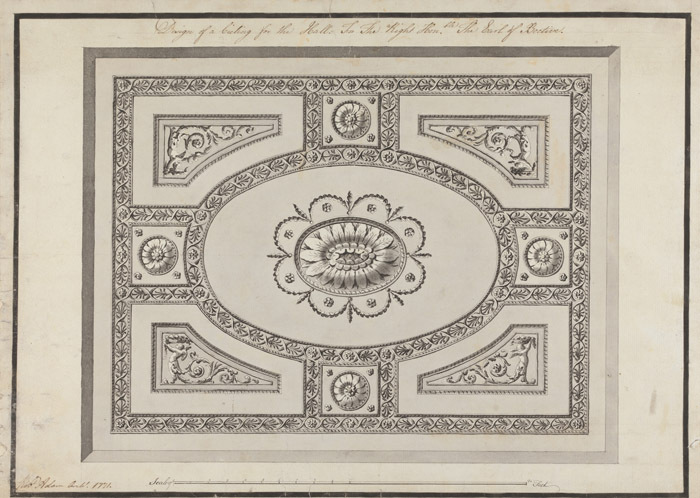 The designs for the ‘Eating Parlor’ show an initial proposal to construct a barrel vaulted ceiling instead of the flat deep coved ceiling built. 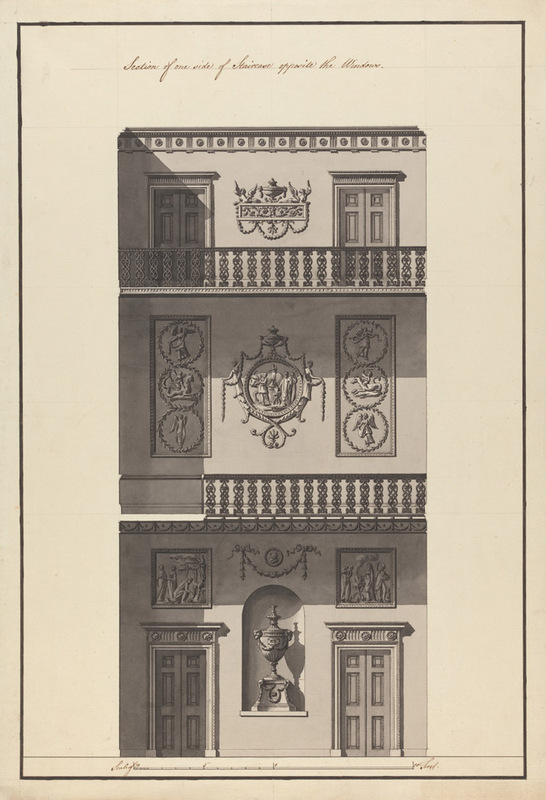 The ‘Eating Parlor’ merged two rooms at ground level with the rooms above these on the first floor. 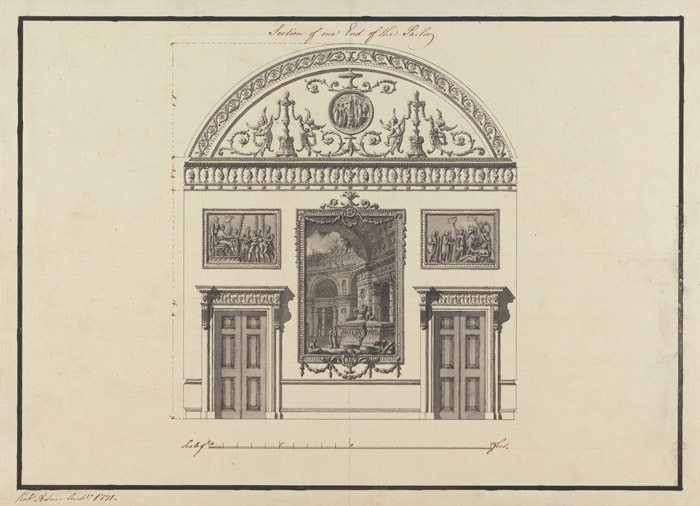 Adjoining the ‘Eating Parlor’ is the Saloon which was also completed to Adam’s design with a central painted medallion of Bacchus and Ariadne surrounded by eight smaller medallions.s. 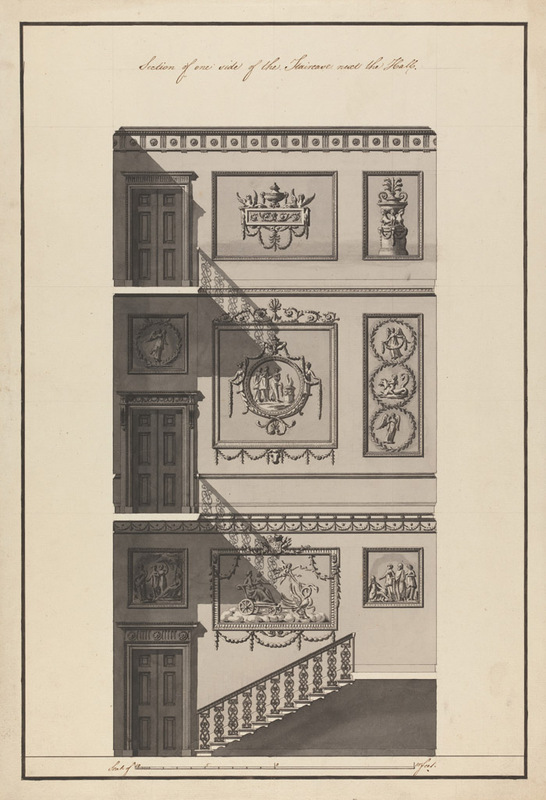 Adam’s drawings for the staircase illustrate proposals for decorative treatments on all three level, which was never completed. 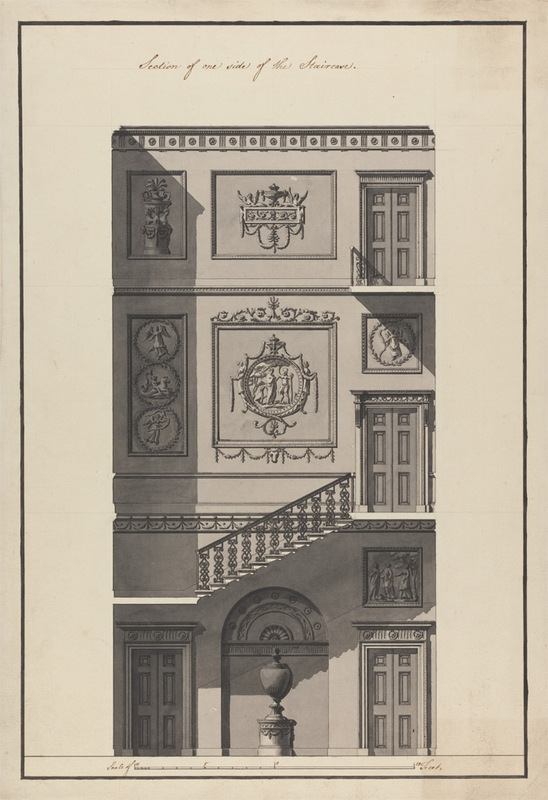 Similarly his design for the entrance Hall were also not executed as planned. 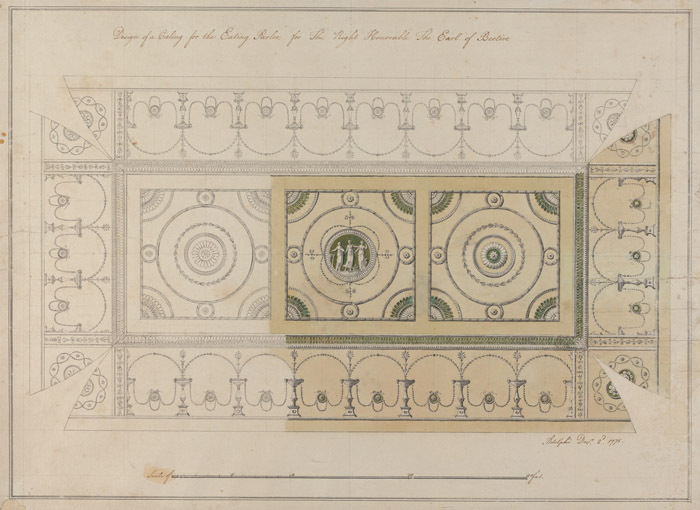 Both spaces do however have fine ceiling designs by Adam.